Each drawer features a safety trigger that will prevent accidental opening and drawer blocking mechanism, to prevent tipping. Rubber top tray with raised sides, to prevent roll-off. 125mm castor set (2 fixed, 2 swivel and brake) allows you excellent manoeuvrability and stability. All drawers have 100% extension rails and are centrally lockable. Maximum weight capacity of 50kg per drawer. Finished in powder coated grey steel framework and blue drawer fronts. Adjustable drawer dividers available to create a range of small component storage. 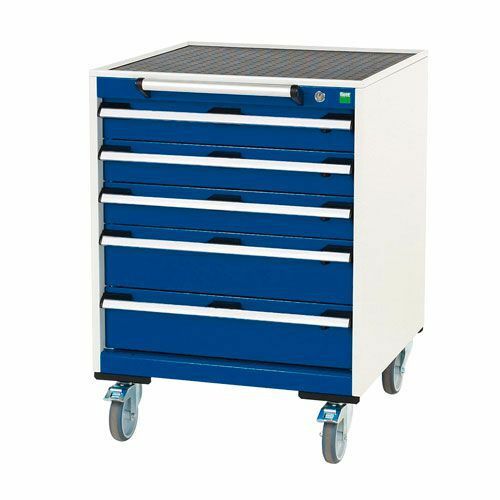 Mobile cabinet, offering office flexibility and ideal storage for small and medium tools/parts. Mobile cabinets for safe and convenient storage in any location.